These are a drop from the invaders coming from the crystals spawning in zones that are under attack by Scourge. Doesn't seem to be that rare drop. Having one in your inventory gives you "Haunted" buff and a dark untargetable ghost follows you around. You can throw the memento to other people to give the item and the ghost to them. Putting the memento into bank and taking it away makes the ghost disappear and reappear in case you need to summon it again without having to throw the memento away to someone else and potentially lose it. You also do a wave emote to your ghostly friend when you lose it; either by throwing the memento to someone else or putting it to bank. Important note about this item is that it does not become soulbound to your character which allows you to sell it in auction house which can potentially be an insanely expensive item in future if you cannot gain them anymore after this event from anywhere. Pet collectors and many other people will be ditching out big money for these. The memento is also unique so you need to store them on your alts or in circulate them from alt to alt through mail box to store multiples. It can be a very good and profitable idea to farm this during this event and store for the future. The "pet" summoned by having this item in your inventory cannot be targeted and has no name above it, however using a Paladin's Sense Undead ability the mob is named 'Scourge Haunt'. You posting this here shouldn't cut into the profits. Only 3 or 4 people read this. Retard. Be wary, you can only do this a few times before your memento disappears. Having one in your inventory gives you "Haunted" buff and a dark untargetable ghost follows you around. However, it's trackable with Track Undead. However, it's trackable with Track Undead. Comes up on minimap as a 'Scourge Haunt'. 20.8.2016 @ Legion pre-patch 7.0.3: As of right now, if you do not have a non-combat (battle) pet out, the item (still) gives you a 15 second buff called Haunted when it enters your inventory, either by someone throwing it to you, or by you taking it out from your bank, and then periodically while it stays in your inventory. The black, translucent haunt will then appear, and start following you. After 15 seconds, the buff will run out, and the haunt will die and disappear. If you bring out a non-combat pet while the haunt is following you and the buff is active, the haunt will disappear without dying, but the buff will remain and run down to zero. If the item enters your inventory, or tries to proc while you have a non-combat pet out, you will not get the buff, and the haunt will not appear. Future patches may, obviously, change the behavior of the haunt, so bear that in mind. Also, there are new quests as part of the zombie invasion to bring something from Shattrath to a home city, having this in your inventory will cause it to whisper evil things to you. The aforementioned whispers are not from this object but from the quest object-- dual-plagued brain and whatever the Alliance equivalent is. Be careful in throwing this to other players. Because they are unique, if you throw it to someone who already has one in their inventory, yours will dissapear. Also catching this or removing from the bank triggers the /cower animation. This is rather a nice companion for a rogue to have: shadow of death and all that. Stealthing makes the ghost disappear, but coming out of stealth does not make it reappear. It only reappeared when I relogged. Can anyone confirm or deny the rumors that this disappears if it it changes hands (including being placed in the bank) more than 3 or 5 times or so? This has been categorized as a combat pet. I am wondering if it will begin to attack anything after a certain event happens. I used to throw my momento to my friend who also has one to 'refresh' my ghost when it dissappears for one reason or another, like taking out a diff cosmetic pet. I still am using the same original one I got, never dissappeared on me, and I've done it a few times atleast. Edit: To be specific. Whenever I threw it to my buddy who already had one, his char would automatic throw one back. I have heard that each time you use the momento it has a chance of dissappearing, so I must admit I have stopped using this method. I've decided to just leave it in my inventory, sometimes I have the shade, sometimes I don't. It would be cool if it showed up with a bit stricter rules, like re-spawning when a diff cosmetic pet is put away, but I like the flavor. I have one in my inventory, but can't see a wraith, although the buff is up. Is there a problem with hunters having their pet out? As far as my personal experience could test... the shade does not dissapear when the wearer of the 'Haunted Memento' goes stealth. Tested 3 times in Warsong and I found that rogues are more easy to track because they have a shade behind them ;). May be someone else can confirm this, because the whole three times i was with the "Detect Invisibility" Buff. regarding the "combat pet" subject. if those who played Warcraft 3, and have done the full alliance campaign and went on to the scourge when king arthas becomes a death knight, in the first mission, you use, "shades" to scout out infront of you in order to avoid patrols, since King Arthas's lvl is too low to kill them all. they do not attack humanoids, but (and i may be mistaking this with another game) they Can attack magical creatures. If anyone who has resently played Warcraft 3, can confirm this, or atleast understand where im coming from with this theory. Since these might be potentially useful to farm, as they'll probably be worth a ton in the far future, I've been thinking up strategies for farming them. Now, you can only carry one at a time in your inventory, which is a problem. This means as soon as you get one, you need to mail it to someone, which doesn't make for great farming, as you have to get a mage to port you each time and then walk back to your spot, which can take a while. What I suggest is having a mage, warlock, and yourself. When you receive one, you drop a summon on the person who gets it, put up a portal to the city of your choice (whichever one has a mailbox closest to the portal zone), the person mails it to an alt, and accepts the summon, wash rinse and repeat. If the lock is running low on shards just get some from the undead mobs you're killing. Theres only one problem with this, the mage could run out of runes of portals eventually, though if you free a bit of space and buy some it shouldn't be a problem, unless you're ungodly lucky and get one every single kill. I have yet to actually test this method, but I just thought I'd throw it out there for you guys, feel free to post ideas for improving this. I just mounted up and rode to the nearest mailbox, which was not far at all from where I chose to farm. I know some spots (like Burning Steppes, or Blasted Lands for Horde) are very far from mailboxes, but spawn points like those in EPL and some in Tanaris are just a minute or two away from one. I think it's much simpler to just pick one of those places rather then hunt down a mage and a warlock, who you will probably end up having to farm for aswell. Can anyone tell me about those whispers? Like: My master has got a message for you. A lot of my friend keep getting them, but i only had them for like 1 day and i cant get them back. they seem to be from the sade, but he doesnt talk to me anymore. also why is it that some of teh sahdes are so large and mine always seems to stay small? Dran Female char. saw a gnome with a huge shade. Drops from the mobs under the scourge invasion 2008. I call mine for Steve and i take him everywhere :3! I'll just sell it again if I need the gold. The best things I find about the shade is that it isn't targettable and doesn't follow you close enough to clog up the screen, so it never becomes a nuisance. Also, in my opinion, this makes a great flavor item for a death knight with its undead theme and background. I intend to roll a DK on an RP-PvP server (on which I only have a level 64 hunter made specifically to unlock DKs and a bank alt), and I managed to get one for free thanks to a mage who was farming the undeads (though the level 69 undeads *were* soloable, given enough time). Later on I found one for 5g on the AH, which I may sell in the future. On my main's server I kept one for my shadow priest and warlock, which I also think are a good match for the shade (although to a lesser extent), one in case I decide to make a DK there too, and another to sell. I foresee these selling for *a lot* if they never become available again, so grab them while you still can! can i die and Haunted Memento Ghost save? I hope blizzard will make the ghost faster, because i really wish to have my shadow buddy always with me. Pet items like Papa Hummel's Old-Fashioned Pet Biscuit and the pet leash don't work on the ghost that follows you around, but interestingly enough, they do highlight the shade when you hover your cursor over it while trying to apply the item. Bought a Rope Pet Leash in dalaran for companions. Tried to use it on scourge haunt because it sempt like a companion. Couldn't actually target it as we all know. Used this on a different post. I MADE IT. I suppose since it's already on here I found a simpler way and a way without TCG cards. Also I found this out without seeing this post previously. Also this was to Havitech, but it was also kind of a comment alone. Remeber if you lost it or sold it by mistake, Blizzard can restore it for you. I've already had a few arena matches on my rogue where I've been able to get an easy opener against stealth teams because I could see someone's ghost following them around. If you're queuing matches, get rid of the thing. Death Knights can actually use Death Coil on them by first using Death Coil before hovering the mouse over the memento. It will say "Scourge Haunt" for a few secs before disappearing. You can actually heal your memento. While normally untargettable, you CAN use a Elune's Candle on a Haunt. Make sure you don't have a target selected, use the candle, mouse over the Haunt, then click. A red and gold firework should shoot at the Haunt. Lots of fun watching a ghost with fireworks exploding from him; and no, it doesn't hurt the haunt. This item is no longer obtainable outside the owners of it during the "Scourge Invasion" world event that took place just before the release of WoTLK. Check your AH for it and get lucky! I personally enjoy the company of my ghost everywhere and he shares all my achievements :D! Truly a unique item in World of Warcraft. These show up on paladins' Sense Undead too as "Scourge Haunt" but are still untargettable in every way. what does happen if you summon your small pet? does the ghost disappear or does it keep following you? Send me a msg on Kilrogg US if you have this item I would be interested in buying it! PST Oxyfast or go ahead and COD it. Just wondering if anyone knows the worth of this item on the AH. Let me know if you've found a solid price tag. It´s just misses of Starcraft or do this one look like Dark Templar ? Since the ghost spawns near me whenever I teleport or login, it sometimes spawns in some fairly strange ways. My favorite is when I log in when flying and see the ghost plummet impassively to the ground or find a perch I wouldn't have thought of. Even funnier when I take my ultrasafe transporter, end up far in the air, and we both fall! i had one of these a few days ago and one of my friends suggested that we should throw it to each other but when he got it he used hes hearthstone and put me on ignore. Is there any way i can get it back? I just accidently right clicked the haunted memento in my bag that I have carried since prerelease of WoLK and it disappeared entirely from my bag. I am a horde hunter and I was inspecting a gnome warlock & I believe it transfered to that character which was NOT my intent. I have turned in a GM ticket but do not know if they'll fix it or not. I am so upset ! curently going for 13k on my server hehe btw will the event ever come back? These Haunted Memento's are going for over 8k on my realm. Freaking nuts. This may be the only proof many people have that they played during TBC. Got a few of these, sold them for 800g each- Ah. Good times. Kept one for me, of course, they've got to be the coolest companion around. Does this Item make you Haunted? Hovering your mouse over it while using Elune's Candle will also show it under the mouseover tooltip, allowing you to shoot fireworks at it. Four of them for sale in the auction house for about 600-800g on Frostmorne. This item does not expire, for those wondering. Seen some on my server for 10k g, mainly because they are only obtainable from those who already obtained it. I don't think i will ever be able to sell mine, it's waaay to rare for me to sell. Devynn, night elf druid, Coilfang. Just bought one for 1200g. After not seeing any for sale in some time, and/or for less than 8k, I figured it was a steal. Can't see the point in lowballing items like this when there's no other way to obtain them these days. All in all, I came out of this transaction satisfied. Your results may vary. I check the AH for these every day. The price varies greatly and you can buy one for cheap and resell it for a nice profit later. On my server the lowest I've seen them go was 400g once and 600g another time. I resold both for a big profit. my scourge has seen more things that a lot of wow players, so its GS should be higher imo, also nerf the mini pet diablo, it keeps poking at it and its starting to get annoyed. had it since the event and never took it off or thrown it. I'm unsure about other servers, but on my realm this goes for 2000-4000g. Bit pricey, I do admit, but seeming that it is a limited item, eventually these will start to disappear and there will be very few active players with it. I was thinking about buying this item on my server for around 5k gold but i am wondering if i already have a non-combat pet out such a Mulgore hatchling will this ghost also show up while i have my pet out? I don't want to keep it in my bag's cause I'm afraid I'd click it and sent it off to some low level. if only they would put in a would you like to send this items box. What items, if any, also give a buff icon from a bag slot? I want to collect buff icon items that do not require a slot that has useful stats. I already have precious' ribbon, and any WOTLK Tabard works for that slot. Two others were on the AH for about 4000g. Will easily re-sell for a big profit. I sent one of these to my friend as a gift, then promptly bought one from the AH just to keep. Well little did i know, my friend had lost his subscription the same day, anyhow we quit wow for a while and I told him I sent it to him, he finally pays for wow again just to discover it's not in his mailbox.. the only thing I can guess is he never accepted it, and it got sent back to me, and since I hadn't played in a while it must have gotten deleted, which is even more of a shame now that they are going for 30kg+ in my server's AH. Sold one for 5k on Skywall :D! This is on the AH on my server for 13k ... I threw this away on 3 of my chars back in the day ! Have it on 2 alts I never leveled beyond 70, one horde and one alliance. Should fit my warlock now ! Sadly I only have 1. And I'm not selling it. And to think I used to throw these to other players. wow...and I'm having trouble selling it for 1k or cheaper on my server. He's like a friend that will always watch out for you..
How can you even GET one? i cant seem to find out where you all are getting this! Have been attempting to sell mine for somewhere in the 14-15k neighborhood (as well as trade for a Chopper) for about 3 days. People seem to think this item's only use is that of a Heavy Leather Ball. I've been chastised for actually using trade for trading. Well no, someone probably threw one at you but your inventory was full. Why anyone would actually throw it at you, that's another mystery all together. I don't have any regrets spending a large amount on this. It will only increase in value, and can be sold again in a year. It's like a cool, creepy investment! I wish Blizzard could make the haunted memento a pet now, that would be cooler! As of Patch 4.1, all non-combat pets will persist through death, portals, zoning, summons, log-off, etc. However, there is a bug associated with the Haunted Momento that will prevent other non-combat pets from persisting. It took me far too long to realize the Haunted Momento was causing the problem, but as soon as put it in my bank, my pets began to persist as they should. I'm guessing whatever hook they used to make the pets persist was the same that was being used by the Haunted Momento. Don't throw it to someone who has one of it. Seems it is destroyed. I wished to free 1 spot and throw it to my Gf char. But she had one more in her bank and it was written "You cannot carry more of this." Hope some Gm will answer to my ticket. They seemed to of stealthed changed the memento to make it so it is no longer able to be tossed. Fantastic change! I bought mine for 100 gold, looking to make a nice profit, and yesterday, I did, selling it for (although this is cheap) 4500g, but what was weird is that I logged on today and still have the Haunted buff and the ghost following me, im sure this will be hotfixed soon but worth taking note. This item can no longer be thrown. Interesting that blizz would make the change so late. Too bad they didn't make the change earlier. I had a friend who had the memento. He threw it to me for kicks, but I already had one and it just vanished due to it being unique. He asked the GMs to replace it, and they point-blank refused. weird thing I noticed today...I sent the memento from my mage to my paladin, and yet, several days later, every time I log onto that mage, there is still a haunt following her and she still has the haunted buff, checked and doublechecked and no one has accidentally thrown her a new one. Any thoughts? As of Patch 4.2 (6/28/11) the haunted memento can no longer be thrown to players. The change we made was to make the item no longer throwable. This was done to fix an exploit where players were throwing the item to transfer wealth across realms. It can be quite valuable. We decided that Haunted Memento was old enough and valuable enough that preventing it from being thrown was a reasonable compromise. As of 4.2 the Haunted buff no longer appears while having another pet out. As of patch 4.2, you can no longer throw the item from player to player. It also would appear not to have that nice ghost following you around anymore. It doesn't appear when you have a pet out. Dismiss it and zone to get it to reappear. You can still trade it, but can no longer throw it in the battlegrounds/random dungeons. Couple that with the upcoming "Invite RealID friends to do dungeons", and one could have transferred them to other realms intentionally through friends to sell/whatnot. So basically it's now worthless. As of Current patch they removed its ability to toss it to other players. To prevent trading it to other players on different servers of the same Battlegroup. As of patch 4.2, the glitch that occured where the Haunted Memento could be traded to another player and then both players still had the ghost buff (even though 1 player no longer owned the item) has been fixed and so this glitch no longer works. As of 4.2 one can no longer throw it to another player, although it is still tradeable and AHable. According to Blue, one could transfer large amounts of money cross-realm by throwing it to a player on another realm (e.g. during a battleground) and then AHing it. The Ghost and Haunted buff will reappear when you dismiss your current pet. Effectively it acts as a pet of its own now. If you do not have a pet summoned, your ghost and haunted buff will appear. Also, the Haunted buff can be removed by right clicking, but the pet will not disappear. Conversely, the ghost and buff will disappear if you summon another pet. Also, the buff and the ghost will both disappear if you start to fly. To get them to reappear, just summon then send away a companion pet. That sir, is because we horde players play BETTER when drunk. Hey, I just wanted to add like all the other bazillion patch 4.2 posters by saying, You can't throw this damn thing anymore. But you can still trade it since its still not BoP. Yay for the change so it cannot be thrown at least! Going for about 7000 g atm on an RP server. Probably will be much cheaper on others though! I have noticed that when i mount on any cataclysm mount i.e. vial of the sands that the buff goes away, this includes ground mounts. It would seem as of Firelands Patch that this item is pretty much useless. The ghost is no more and you cannot throw it to anyone. A pointless, worthless item which was awesome in a pointless way.. Thanks blizz, I'll go play League of Legends now. You no longer get the haunted buff, ghost or the ability to throw this item. If nothing other than sentimental this item has become useless. My memento buff has also been going away when I mount. Just tried it on my alt because I'm trying to get the inkeepers daughter to proc on my main since it stopped doing that with the memento in my bags. Has the effect of carrying this around been removed from the game? I still have the trinket in my inventory, but I no longer have the buff for it, and my ghost is no longer around. I'm really glad they took way the "Use: Throw to a friendly player." thing off it. I was always kind of nervous I was going to accidentally throw it to someone and lose it, since its worth so much now. If anyone was still wondering about the bug where the buff and ghoulie go away when you mount up, it's now fixed on ptr. Encountered an odd bug with this with the new patch today (4.3), it seems the shade's speed has been reduced and he can no longer keep up with me even unmounted on the ground, forcing him to constantly respawn, and every time he does i /cower for a sec. Minor, but annoying, especially when im mounted because it happens every few seconds. As of 4.3 the bug which would make your Haunted buff go away if you were on a flying mount has now been fixed. Since Cataclysm's release if you were not a druid in flying form your Haunted buff would disappear and not reappear until you rezoned or something similar if you lifted off the ground on a flying mount. As of 4.3 there appears to be a glitch with having this in your inventory and attempting to sit and barber's chair. You will sit, then suddenly stand back up and cower emote. As of Patch 4.3 the shade seems to be causing a multitude of problems. I've been noticing flight path mounts stalling as my character does the cower animation from the shade trying to catch up. I also can't get a haircut because my character cowers every time I sit down in the barber seat. Of course that could also just mean my character is afraid of getting his haircut but I think I'll go with the former. Little known fact: in patch 4.3 when sitting in a chair or on a flying mount that is off the ground, if the momento is in your bags it will force your character to do a momentary /cower emote. This can be quite amusing when trying to change your look at the barber as the cower animation will bring you out of the chair within 2-3 seconds. It was driving me mad that every time I took a bird flight, the bird would loose it's sense of direction for some reason. It seemed to go round in circles on every zone boundary (adding to the time taken to fly anywhere). Eventually tracked it down to this and so the momento is now in the bank - shame. Current bug with this item: Sitting down on a barbershop chair, the haunted memento will cause your character to stand up making you unable to fix your hair. For anyone curious, 4.3.2 did not fix any of the issues with this item. The cower effect this item has does not seem to let my character use the barber chair. They removed the tossing feature, and atm 4.3.2 they are bugged aswell. Abit speculation here, these things might get redone as learnable pets in the close future and be tossed into old or new content as rewards. If you look in the past, it's not something new that blizz has done. Haunted Memento seems to bug me out, whenever I'm on a flight path now the Wyvern seems to stop and spin because it's waiting for the ghost to catch up. If you notice this happening, chuck the Memento in your bank until later use. Edit: Every patch I take my Memento out of the bank to see if this has been fixed. As of 5.0.4 it has (at least for me). If it still doesn't seem to have resolved itself for you, back into the bank it goes! Can anyone please tell me? Is this item not available anymore? Caution: Having this item in your bags may cause taxi services to be retarded! Still not fixed in 4.3.4, the annoying /fear emotion is still there. But now the shadow follows you on the ground, whether you''re flying or not. It's not "flying" anymore. This item shows up in the 'Consumable' category in the auction house, but none of the sub-categories! where would i get myself one of these? Not kidding, this memorabilia made me fly through mountains on my way from thunderbluff to orgrimmar. Log out helped, maybe. From the scourge event that was right before wrath. Its kind of a waste to throw it to a random player because of the scourge minion that follows you. I kept my Memento since original Scourge event, but eventually got tired of not being possible to use hairdresser or how it messed with gryphons when using flight paths. Not wanting to either sell it or occupy space in my bags/bank, I put it on Auction House for 30k, which I thought was a prohibitive price, and I was renewing the AH "deposit" every 48h with my other auctions. To my total surprisal, after several weeks, someone bought it from AH. Today's patch (5.0.4) has finally fixed the nasty effect the Haunted buff has on Flight Paths. Unfortunately, Barbershop Chairs will still eject you after a short period of siting in them. So, unless you regularly change your hair style you can carry this item around without consequence again. Do not have this item in your inventory if you are planning to do any type of PVP. The ghost seems to disappear once you go into stealth but will reappear each time you do the /cower effect. This happens roughly every 2-3 seconds and the ghost can be seen by all players when it reappears. Because of this enemy players will roughly know your character location and can aoe the area. I've easily found other players in BGs/arenas who have this item and is the reason I do not keep it in my bag. Patch 5.0.4 seems to have fixed some problems, however I just tested the stealth bug and it is currently not fixed. Is it just me, or has this started interrupting eating in MoP? As of patch 5.0.5 this causes several issues in Mists of Pandaria. You character will randomly do the "scare" emote. This cancels drinking and eating food. Additionally, you won't be able to use the barber shop. The main most annoying bug is the NPC Guards in Halfhill (where the cooking dailies are) will randomly attack you if select any of the vendors (doesn't matter if you are mounted, left click...etc). It is recommended that you bank this item until it is resolved. In patch 5.0.5 having this item in your inventory can cause the NPC Guards at Halfhill to attack you. You can easily escape these guards by running into the phased zone surrounding your garden at Halfhill. Once in the phased zone the guards will disappear, and you can continue your business at Halfhill. The aggressive guards will not be present after leaving the phased area. As stated many times above, this item can no longer be obtained. Basically this mean that this is a good item to invest your money in. The constant inflation and the rising number of people with this item quitting the game makes it even better. If you happen to find any of these for less than 20k on your AH, like i did (16.8k), and have the money to spare. BUY IT! As of Mists of Pandaria, all bugs associated with the Haunted Memento seem to be fixed. Also, the ghost will disappear when you stealth and reappear when you unstealth, allowing you to keep it with you in PvP without giving your location away! Someone just spammed trade for this for 3k. I offered 2k, he took it. Awesome, never thought I'd have one of these. They have fixed the bug (360) when flying with Flight Masters flight paths. It no longer stops and spins in every zone! WOOHOO Blizz! Still does the auto Cower emote, but no 360 spins! This "pet" is affected by Glyph of Shadowy Friends, too. While most of the old problems with this item seem to have been fixed, I did notice one today. I seem to be unable to get a hair cut without cowering before I can change anything. Small problem, and one easily fixed, but I thought I would put it here nonetheless. You do a /scared emote on dismount and other triggers with this thing, its funny dismounting and having a terrified look on your face. Im probably just paranoid, but everytime i have to move this item around in my inventory, like when i get a bigger bag etc. it feels like the item is going to disappear or fly over to another player. This even after the removal of "throw me" from the item. So everytime i have to do it, i recheck and triple-check my quadruple-check just to make sure i dont lose it. I'm across 3 realms and the price of this item is A LOT Different per realm. I was luckily enough to have a friend just recently come back from a long break, he quit about 1 year after LK, He had quite a few of these in his bank around 9 or so i was told. Any ways i picked one of these up off of him for around 7.5k which is well worth it, Tried to get a few more for that price to resell. but he Could only sell me 2 extras:( Ohwell. Obviously as more players quit (Which is clear if you look at Blizzards subscription rate, dropping quite fast) These will go up in price, Hoping to be able to sell Some of my extra ones, one day, when they are worth more. This item was a relatively easy item to obtain during a WoTLK event and cost little more than 1g but now, two expansions later this item is one of the most sought after items in game and sells for an average of 15k. Since MoP has been released this items value has dropped slightly as it's only appealing quality now is that it is unobtainable due to the face that to get the Shade to stalk you around all you need to do is have a level 18 battle pet, fly out to Deadwind pass and tame a http://www.wowhead.com/npc=61375. On any AH you can find them ranging from 10k-75k in price but people get strapped for cash and usually part with them for between 7.5k-10k. It seems now that the Memento Ghost will not come out when you have Companion pet out, and will disappear when the pets are summoned and reappear when they are dismissed. This is one of, if not the rarest thing I own. Now that 6.0 has announced that it is going to start arranging our bags for us and removing vanity items, I'm concerned that it will either remove this from my bag and put it in the collections tab or simply remove it from the game. I don't wish to say goodbye to that phantom that follows me around just yet. Blizz, the only trade I'll make is for a Corrupted Ashbringer. :P J/k, j/k.....but seriously. As much as I love this item, the scared emote it does is a bit too frequent for me, so it's sadly in the bank of my main for the time being. My Feral druid uses his all the time though, as there's no emotes happening in animal forms. Kinda wish they'd tone down the frequency of the emote. I have two of these, and I'd like to know how much one can sell for. Best advice: Stop selling it in the Auction House or Trade Chat! Why? The value of this item is only as high (or low) as the price you openly advertise. Think of a player who quit during Cata and MoP and now they're returning to the game for Warlords of Draenor... (a real situation) they may have an alt with 20 of these in their bank and would be thrilled to know you'll give them 500g each because they simply didn't know any better because you didn't have your 1 in the AH for 20,000g! There would be no reason for him to go out and research the price of Haunted Memento online because to him/her it was junk back then. More often than not, you may have an average server price of 15k to 30k or more consistently for this item. That's a lot of money to you the collector and gold enthusiast. But to the extremely large majority of players, they would be in shock that they could make a hefty 5k on 1 little item and would trade it without blinking. Those are the exact same players who get the "if its epic quality, its 'super OP' I want 100k for it", and "if its common (white) quality its junk, I don't know what wowhead is" and will part with it for a crazy low price because you didn't spam trade chat and AH that its worth 30k! When the time comes, find someone looking for this item to buy from someone for a large amount of money, and then you can privately make your fortune. I remember when these first came out long ago. What is not talked about much is that initially they were bugged and if you put them in your bank, the banker NPC would disappear. My guild got the all the bankers in Shattrah to despawn this way, and there was much QQ on trade chat. I think it's time to give the Scourge Haunt a buff. Like maybe a 200% speed buff? I really hope some time in the future blizz makes him the same speed as the other non-combat pet XD. Everyone! Put in a suggestion to blizz asking them to buff his speed! what happened with the ? Did it loose its effect. Does'nt seem to have a use or a equipp effect anymore. Bugged or intentional fix? I know I threw at least one of these to another player the day I got them. At first they weren't unique and I had about 4-5 on my warrior. To this day, I am still defying the laws of uniqueness by having multiple on 1 character. It seems Blizzard has forgotten this when it comes to the toy box. Still a white object in my inventory, forever haunting me. Do not get confused by the similar name! This is the Haunting Memento for toy box. Sold by Chester for 90 Darkmoon Prize Tickets. You can now visit your local barber without being scared out of the chair! While farming Necrotic Rune during the Scourge Invasion back on WotLK launch, my bags went full, but I seem to had to make some space right away. For some reason I didn't found anything else to destroy, except Haunted Memento. ... and this memento still haunts me every time I see this ghost in-game. Beware! 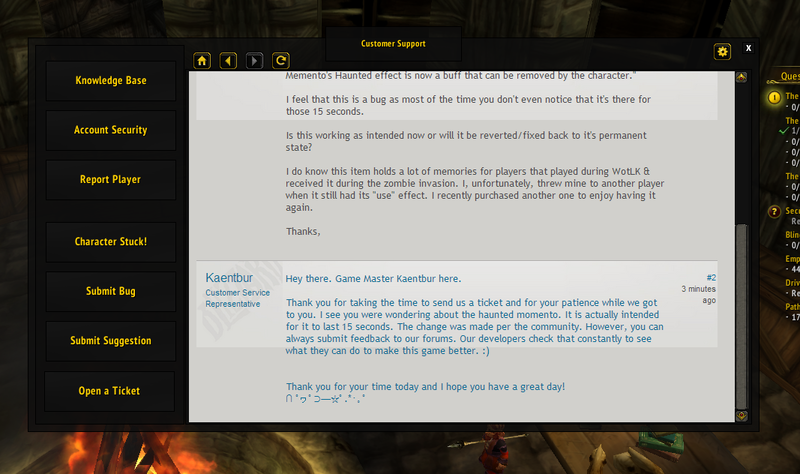 While recovering account from a compromise right before 6.0, i asked for my memento back. The GM said they couldnt find it, so i dont get it back. Maybe linked to there now being a blue one you can buy pretty easy and they both have the same name. Bug? You lose the buff Haunted which Haunted Memento gives you, when you summon a battle pet or use those conjured mage pets in 6.0.3. Has anyone heard if this will be added to the Toy Box for WoD? So far as of this patch 6.0.2 it isn't. It would appear the item has been changed to now only summon the spirit at random intervals rather than leave it following you like an non-combat pet as of warlords release. Haunted Memento's Haunted effect is now a buff that can be removed by the character. Nothing further has been said though. :( I put in a ticket, and still no response. I get a 15 second buff, every 30 minutes and then it's gone. You can Ctrl - F (Command - F for Mac users) 'Haunted Memento' to quickly get to the note. Nothing further has been said though. :( I put in a ticket, and still no response. I don't even have the buff that can be removed. I get a 15 second buff, every 30 minutes and then it's gone. You can Ctrl - F (Command - F for Mac users) Haunted Memento to quickly get to the note. This item has been ruined. It periodically gives you the Haunted buff instead of constantly now. I've seen it pop up every half hour or so. As of the launch of Draenor, the haunted shadow that follows you around will despawn after about 20 seconds. It then respawns roughly 5-10 min later, only to disappear again. Strange how they changed an item that is relatively unobtainable, this far into the game's life. Logged a ticket about this and finally got a response now, it appears they intentionally removed the follower because some people were having trouble with it on flightpaths, even though I never heard or had that glitch. It's a shame they made this so useless now. Response from GM about the new "feature". I'm still unsure which part of the community hated this thing. I honestly never had issues with others having it. People who had a problem with this should have simply left it in THEIR bank rather than imposing THEIR problems on unwilling participants. I don't understand why they couldn't fix it instead of destroying the uniqueness of the item.... simply lazy. So we now have an official reason as for why this item was changed, and that this change will not be reverted. It was the #1 source of creature spawns within the game, which was causing server performance degradation, and during launch we changed its behavior as one of many tweaks to help recoup some server headroom. Due to the ongoing demand on the game service (and likelihood of similar demands in future expansion launches) we're not currently planning to revert it to its old behavior. Come on blizz get off your stacks of money we pay you every month and un-nerf the Haunted Momento I loved seeing the little guy he is so cool. Why not like he was doing anything wrong.. I finally got my hands on one of these today, paid 11k for the thing. Only to find out the buff isn't permanant anymore. Needless to say I'm incredibly pissed off about it. CHANGE THE MEMENTO BACK TO THE WAY IT WAS BLIZZARD! Unfortunately, this item no longer has a permanent effect with your friendly ghost following you. It is now a buff that the player can remove and lasts for 15 seconds. The chance that the buff is applied to you is random by what I have seen. My speculation of this is because there is also an item, namely the Haunting Memento which when applied to a target lasts 15 minutes long and during that period every 3-4 minutes an effect will happen. One of these is a ghost (different model to our friendly shade) and happens to last around 15 seconds. Perhaps these two buffs (one being hidden ) were caught in some kind of mix up and it will eventually be fixed? Another possibility is that it could have been temporarily halted like this much like the infamous Toy Train Set. Will we see our friendly shade again that would follow us in raids, fishing trips and more? Only time will tell. Edit: Due to the Haunted Memento Ghost being one of the largest 'creatures' spawned in the game, it would and is better for the game's servers states for it to be reduced to a periodic 15 second summon. "It was the #1 source of creature spawns within the game, which was causing server performance degradation, and during launch we changed its behavior as one of many tweaks to help recoup some server headroom. Due to the ongoing demand on the game service (and likelihood of similar demands in future expansion launches) we're not currently planning to revert it to its old behavior." Thug Life much? This must be one of the biggest lies I ever seen them pull, after reading this I wonder about what else are they taking us for idiots? The ghost is nothing else than a pet. The fact that you couldn't have any other pet out proves it. They share the same mechanics except it isn't a battle pet. This pet alone cannot possibly be the #1 source of creature spawns, especially considering its rarity. One of the rarest item, probably something like 1/1000 players. There are 300+ other pets which also spawn, whenever you mount, stealth, unstealth, etc. The permanent buff changed to 15 sec has nothing do with spawns. Why not leave it to 1hour buff or permanent like it was. 15 tiny sec. The buff was the primary value of this pet, the ghost was a side effect. This change coincides with the introduction of the wow token. Nice timing. This object had been around for 6-7 years and they woke up on warlords release and it's the "#1" creature spawn in their game. You really buy that? Aren't the #1 supposed to be the mobs we kill? What do you think they were working on when they pushed this change? What was the price of the haunted memento? Around 30'000g. Many of these are dormant on inactive accounts... Close enough to home? If you can't see Blizzard's hand, just concede already. The new 15s proc breaks Stealth as a Rogue. Probably breaks prowl too, but I haven't bothered to send it over to my druid to test. Guess I'll have to send it over to my warrior since it keeps breaking me out of stealth randomly in BGs which, more often than not, leaves me in a bunch of trouble. BLIZZARD .. WE DONT GIVE A DAMN ABOUT WATER THAT RIPPLES.. STOP TAKING ALL OF THE COOL STUFF OUT OF THE GAME.. shooting yourself in the damn foot. This thing has a terrible proc rate, appearing once every 5 minutes. The only problem this thing had was that while you were mounted on a flight path your character would constantly spin around. If blizzard had deactivated this item while in flight there wouldn't have been an issue. Now this thing is pretty much useless. Is there a way to macro or bind sound files to a proc? I know how to do it to abilities, but not random procs. I would love to add a random Corrupted Ashbringer Whisper to this this item when it procs now. Especially with Corrupted Remembrance skin in Legion. One of the most nostalgic items in wow. Too sad that they had to nerf it because of server lags due their permanent spawning and despawning. Edit: Sorry for my bad english. I am german. If you came here checking if Legion 7.0 had changed something, I'm sorry for you. To be more precise, you probably tried searching for "7.0" or "Legion" on the whole commentaries page and you did not find something... just this stupid post of mine to make you sad! I'm sorry, really really sorry! Don't get upset but I gotta tell you, that I've checked it in game and it didn't revert to pre-draenor status. In any case, don't lose your hopes and maybe... just maybe one day.... who knows. Sad. Hmm, I still have four of those. Are they still worth much? It removes stealth from my rogue when the "buff" appears. It's gotten me killed a lot. As of patch 7.1 you cannot throw it to other players. I've had one in my bags since I got one, and I've come to realize that I can no longer throw it to other players. How can players get these and is it worth getting anymore? This item is purely an item of vanity, a representation of the past. If you played in the pre-launch event, you'd know the important of it, and It would hold some form of symbolic meaning to you. A player that did not play in the past may feel like it's garbage or not worth the gold to buy one. They can range from anywhere from 30,000-120,000 depending on the server. Since this is not a toy, and just has a ghost follow you periodically from time to time, it doesn't really hold much value to the eyes of the newer players, especially since it is a vanity item. Rather an item such as the Pocket Fel Spreader will be an item that sells up from 100,000 - and Up+ This is due to the fact that this item is a toy, it will always have symbolic meaning to any player, and only gets more expensive as time goes on due to the fact that no one can get it anymore. In the future it will probably sell for millions, but right now in Legion it will not sell for 100k+ due to the fact that everyone still has them. Perhaps in 2-5 years they'll sell for that much. It all has to deal with supply and demand. Once the supply is gone, they're gone forever. So with a limited supply, and a high demand, especially a newer demographics of wow players coming in, it will be an item that can sell for quite the amount in the future. It is always important to reading Wowhead so that you can find out information on what to buy, and what to sell. Treat it Jim Cramer for the Stock Market if you will, that's how I look at it. Thank you for reading my post, happy huntings! They really need to take the time to code in a fix for this item. It's one of those things that long-term players loved so much. I get that it was bugging things, and they had to turn it off. But that was YEARS ago. Give somebody an afternoon to fix it. They'd be a hero. If you had one of these in your inventory before the patch, the buff effect (the permanent one) was still applied. Then i made the mistake of using the character boost and then it was whisked away to the mailbox, and i lost the permabuff. Here is what makes this item special to me. For all of us who experienced the Vanilla Naxxramas raid in some way (i.e. before WOTLK, and even before BC), these shadows could be a pain, and gave a very special atmosphere to the dungeon. Your very own personnal Shade of Naxxramas follower. Unsure if it was changed back to it's original state as of 8.0, but I saw someone with the ghost constantly with them about 2 days ago, would someone kindly confirm or deny if it has been changed? the item created an npc that was constantly up. it was the number one source of creature spawns in game. most of wow's creatures are pretty much loaded on demand or on a set spawn timer. they are not constantly up. this is why it will most likely never return to it's former state.